Good Vibes Wood Watches are uniquely crafted from the most attractive forms of wood available, with special focus on combining amazing grain patterns and unique style. Embrace your individuality by expressing yourself in a new life with Good Vibes. These lightweight stylish wood watches have been worn by music’s pop superstars and professional athletes across the world. No two watches will ever be the same as all wood cuts are different .Even as you wear them, the oils from your skin change the color and look of the wood watch growing with you. Good Vibes Wood Watches Buy Now! 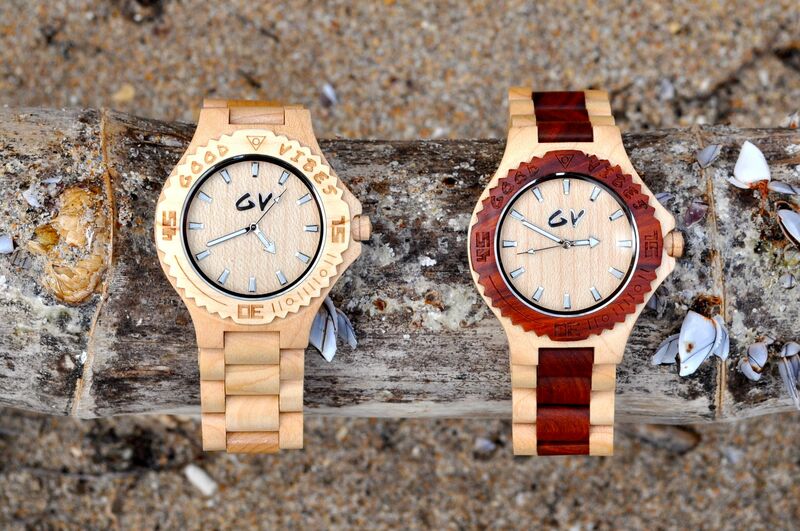 Above, our first two wood watches “Golden Grove” and “Brown’s Town” represent an island lifestyle on a bamboo shoot. They are named after Jamaican towns. Golden Grove and Brown’s Town are constructed from all natural maple wood, the same type of wood that is used in musical instruments and barbecuing. To create a two toned color, we added Red Sandalwood to Brown’s Town’s bezel and band. Red Sandalwood has been used in some of the finest furniture crafted so naturally it looks great. Since they were created from all natural wood, these hypoallergenic watches won’t irritate your skin as they compliment your individual style. Most importantly the compliments you get from wearing these watches is incredible! Although originally designed for a man, women have especially loved the look as the boyfriend watch style is currently a trend. Make sure you stop by our shop and get one today! Shop Now! All watches are under a 90 day warranty, we pride ourselves in providing excellent customer support and great quality products. Make sure to follow us on Google,Facebook and Twitter for special seasonal discounts!